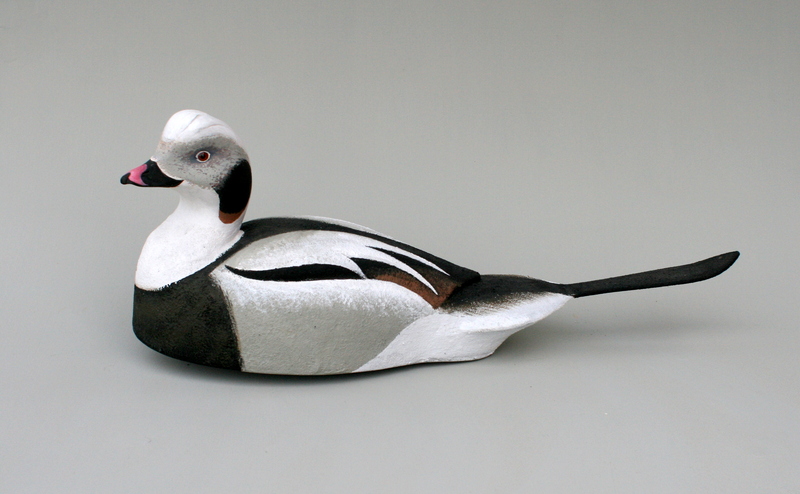 The Oldsquaw allows me to express my decoy carving philosophy and style more than most species. It allows me to incorporate all of the most important design elements in a single floating sculpture. 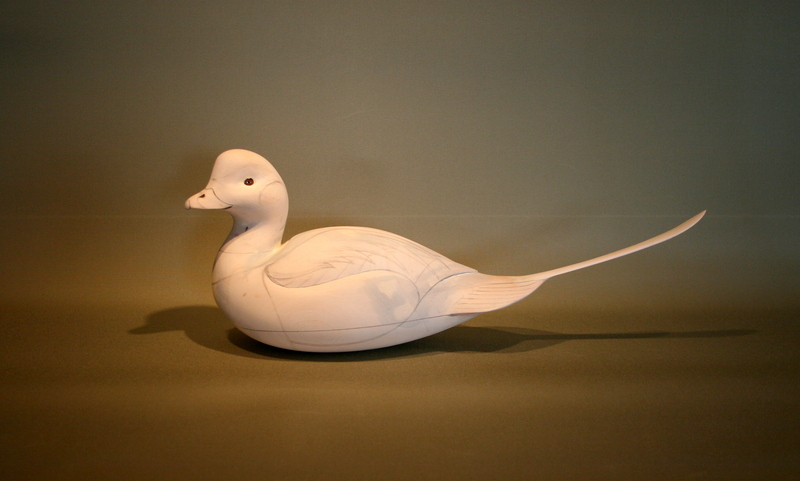 Most of all, this bird is about curves – they are everywhere on the bird and allow me to emphasize and even exaggerate them so that they can all work in harmony. 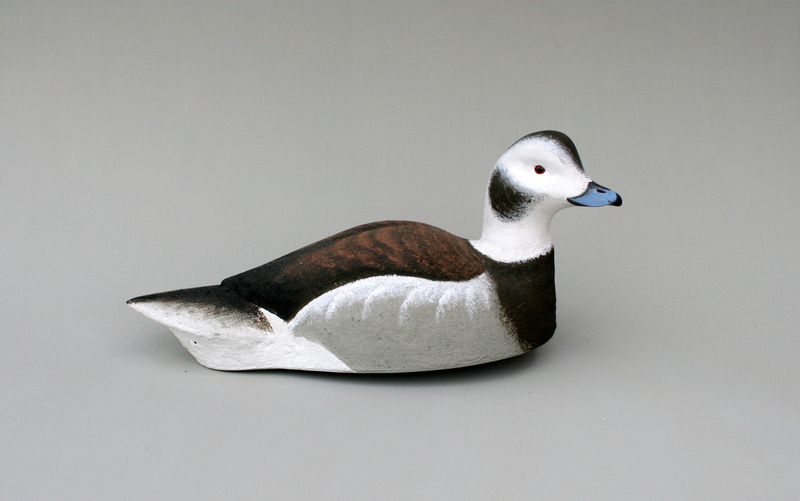 Although I have carved a few gunning Oldsquaw decoys, my “mantelpiece” Oldsquaw requires – in my mind at least – the round bottom to complete the sleek and voluptuous form. 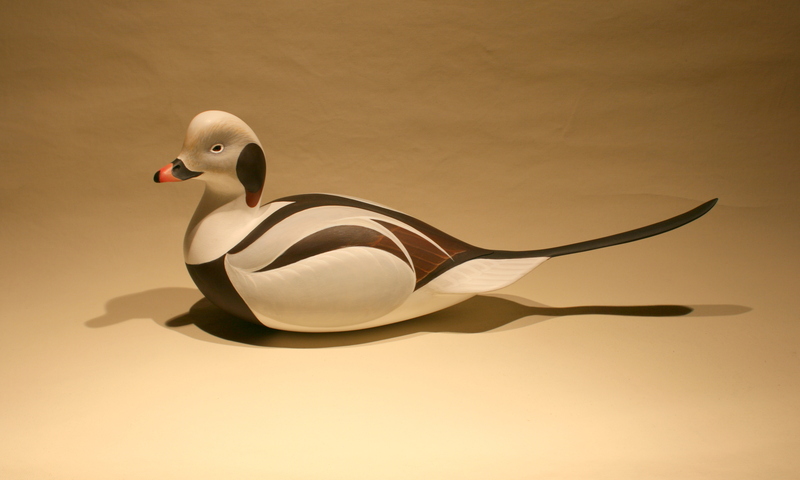 The head, body and bottom board are carved from either White Pine or Basswood. The tail – slightly exaggerated for length and sweeping curvature – is sawn from a Shagbark Hickory limb. I select limbs that grow at the same curve so that the grain runs with the upswept tail. The body is hollowed so that the walls are about 3/8-inch thick – or thin, actually. A typical carving like this weighs about 1 pound. To my way of thinking, this is an important feature of the art – it speaks to the workmanship that must be a part of any heirloom-quality piece. In addition to the form and major color patches – where I again take some liberties to impose my own ideas about fair curves and hard-edged boundaries – there is also the opportunity for subtlety and softness. I enjoy contrasting the “diagrammatic” cheek patches and the two-tone bill with the soft face and its several transitions in tone and hue. 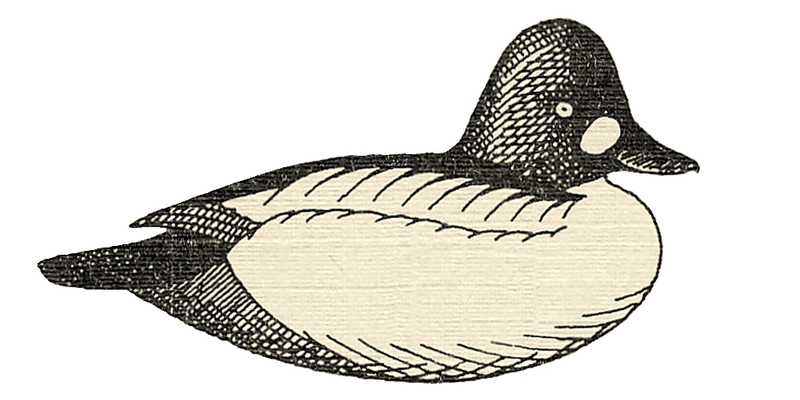 Likewise, the chestnut speculum and the individual tail feathers are intended as surprises, discovered only upon close inspection. 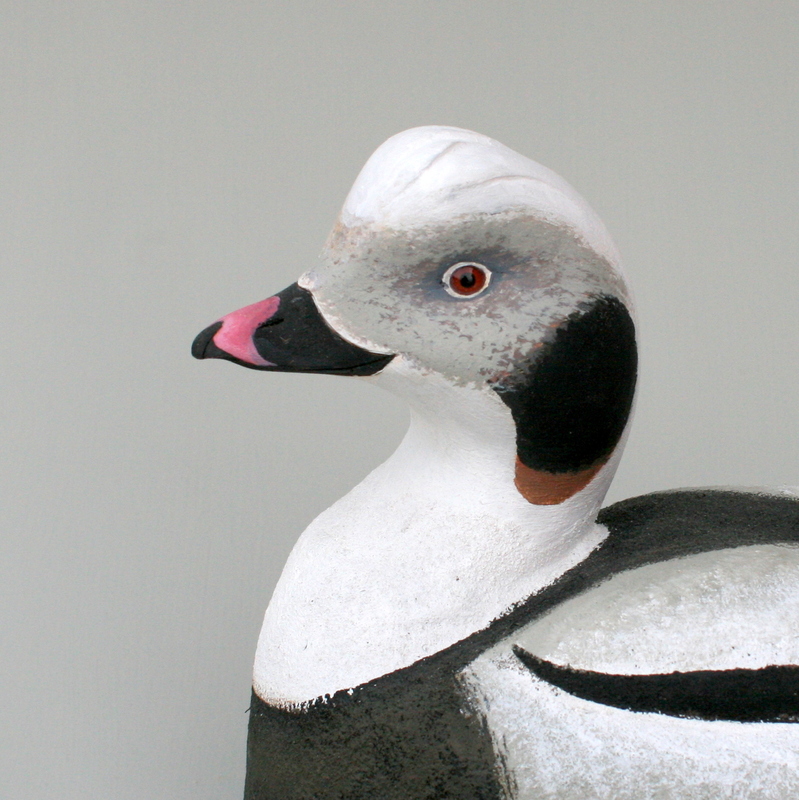 I carved this gunner for the very last U. S. National Decoy Show in 1994. The life-size body was carved from 2 pieces of balsa given to me by a friend; the pieces were joined side-to-side instead of top-to-bottom. The tail insert was made from a piece of plastic garbage can cover. Everything was sealed with marine epoxy to toughen it up. 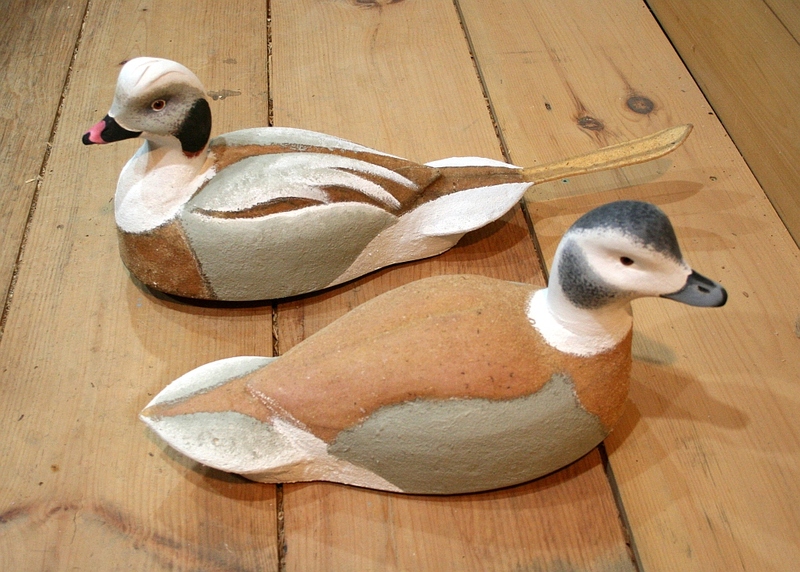 Most gunning bird contests would disallow the plastic tail but I appreciate the fact that decoys have always been made from “found objects”. Spars and life-jacket cork were followed by refrigerator cork – so why not foam insulation and trashcan lids? 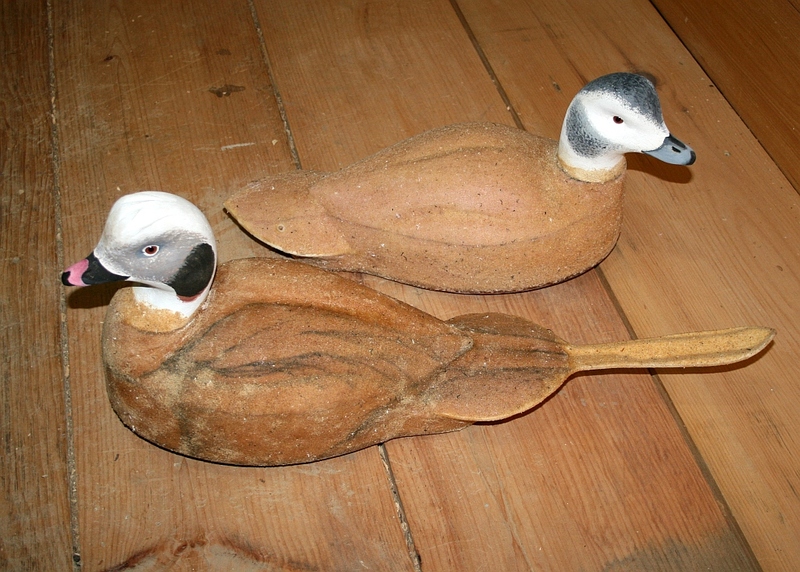 This pair of Oldsquaw was made from foam insulation board. As with my other “foamers”, I use a plywood (1/4″ AC) bottom board and pine heads. The tail inserts are “scrounged” plastic. The heads are fastened with stainless steel eye screws and the ballast is (or, will be – when I make them) lead mushroom weights with a screw molded in. I made them of a size to “match” my Broadbill rig – which is mostly Herters Model 72 (oversize). Here they are getting their paint. Their “skin is thickened (with Cabosil) marine epoxy and fine (from my bandsaw) sawdust. The sawdust is sprinkled on while the second coat of epoxy is still wet – so the wood particles absorb the resin and cure hard and about as rough as 80 grit sandpaper. Best of all, they require no sanding and no priming. 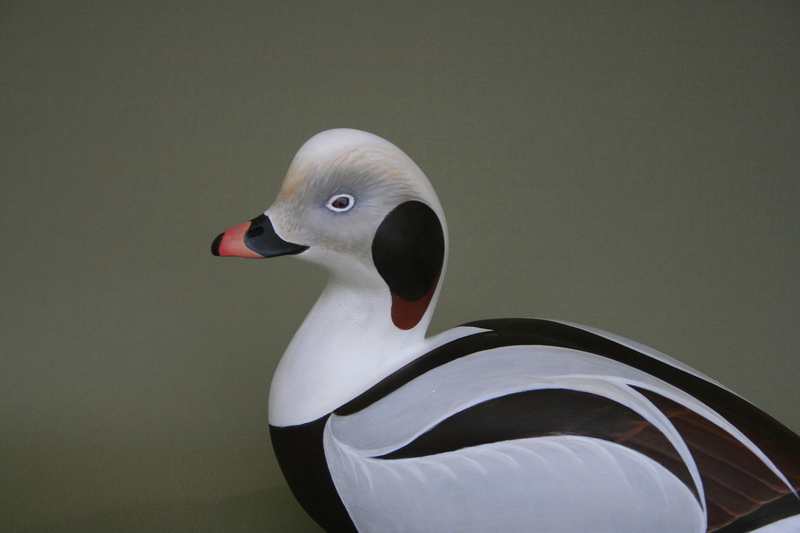 I carved a full crown into this drake – to give it the “command presence” these birds possess. 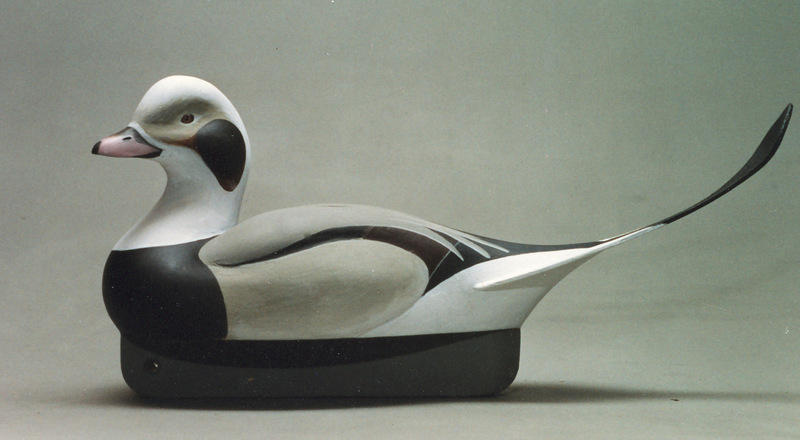 I am interested in a duck carving half model of an oldsquaw that will be mounted on an oval placard that will be installed on my varnished transom of my boat named oldsquaw . Also may have other similar carvings on a smaller scale for accents thru out the cabin. . The boat is a vintage 1958 down east cruiser called oldsquaw. Look fwd to your reply .